I'm still maintaining my run-streak. I didn't plan to, and I'm not thinking about how long it'll continue, but I just seem to keep going out for a run. Today was day 14. I don't always run very far, (I've done a couple of 2 milers) but I am absolutely loving it. I'm starting to feel fitter, and am taking the opportunity to discover new paths and explore woodland I haven't run through before, even though I've lived here for over 4 years now! Most surprisingly, I've also embraced early morning running...getting my runs done before work and not having to worry about it late at night when I'm starting to get comfy on the sofa has been wonderful and seeing the sunrise is a spectacular start to the day. 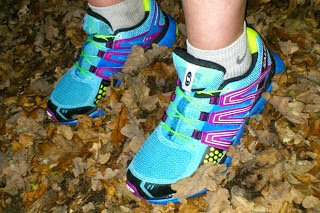 I've also bought some new Salomon XR Missions which I'm just getting used to - I'll do a review on the fit and ride of them at some point, but at the moment I think they're the most beautiful shoes I've ever owned...although it wont be long before they're covered in mud ;) There is definitely motivation to be found in new gear! 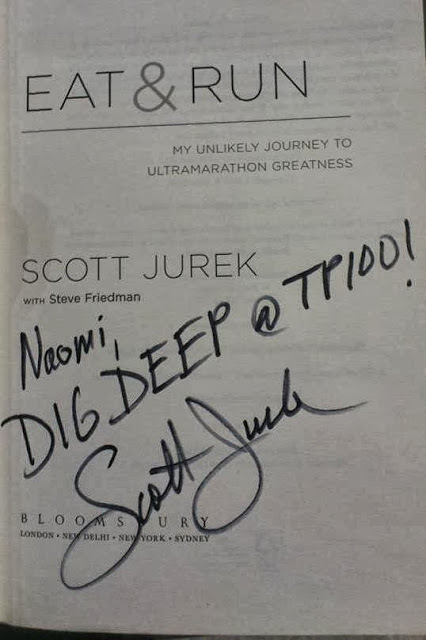 To add to my recent enthusiasm, on Monday evening, I got some extra inspiration from attending an interview, Q&A and then book signing with Scott Jurek, who is one of my ultra-running heroes...I've read his book "Eat and Run" a few times and have an interview he did in Time magazine pinned by my desk, which I look at most days. So, after work, I joined a small audience gathered at the Bloomsbury Institute, and waited expectantly....before too long, we were joined by the man himself, and his interviewer, Richard Moore. It was great to be in the same room as Jurek and listen to him talking about his experiences growing up and becoming a runner, although a lot of the interview just went over things in his book. The Q&A was where it got really interesting, where Jurek gave advice, and talked about all sorts of different (ultra running related) topics - what he thinks about up-and-coming runners, the barefoot craze, why he lives in Boulder, how he fuels through a race - all sorts of things. At the end of the talk, Jurek hung around for ages, signing copies of his book...we could either buy a copy there, or he would sign our own, which is a good job because I think 9/10 people had well-thumbed copies they pulled out of their bags! I was surprised at how nervous I was as my turn came to shake the legendary Scott Jurek's hand, pass him my book, and exchange a few words. 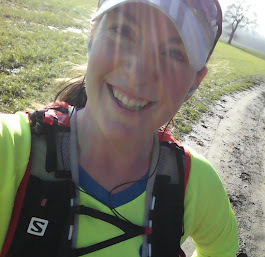 I mentioned I was training for my first 100 miler, but to be honest I can't really remember else what we said - I just vividly recall walking away with a stupid grin on my face. Here's my signed copy of Eat and Run which I'll treasure... I think Dig Deep might become a new mantra! I am so pleased you are getting the inspiration you so badly needed Naomi, I am also happy that a pair of shoes are working well for you, a very rare find indeed but once they work for you it can only make those runs a little better....onwards and upwards. Ultra runner trying to get back to full fitness after having my son in February 2019, and my twin daughters in November 2016. Have run 100 marathon or ultra distance events, although 3 don't "count" under 100 Marathon Club rules so still chasing full club membership. Long term goals are a sub 35hr GUCR (PB 37:20) and a sub 3:30 marathon (PB 3:49), if I ever find the time to do some "proper" training. Completed 10 Marathons in 10 Days. My new tattoo...with 7 weeks to go until the Viking Way! © Naomi Newton-Fisher. Picture Window theme. Powered by Blogger.